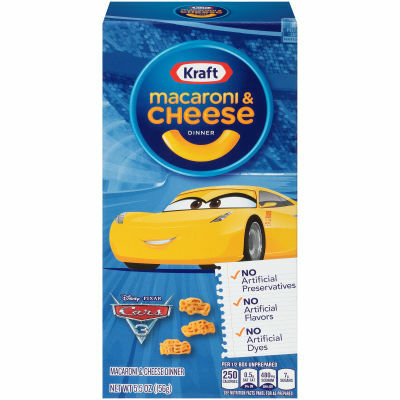 Kraft Macaroni and Cheese Dinner in Fun ShapesFeeling hungry and bored together? Kraft is now having a solution for you. Grab Macaroni and Cheese Dinner latest range of fun filled shapes in your favorite SpongeBob Square Pants shape. Tantalize your taste buds with the enticing cheese sauce with a hint of paprika to excite your day with happiness. Grin and square it with SpongeBob and collect all 3 Trivia Cards on back of the pack. Crafted with care and precision from USA for the people who love their SpongeBob and have impressive imagination just like of their Spongy boy, oh buoy!Exciting Love at First Spongy BiteImagine sitting with a bowl filled with velvety textured cream and lip-licking pasta with SpongeBob Square Pants. Isn't it amusing to visualize it? Yes with a bowl filled with SpongeBob, wrapped in yummy cheese sauce is tempting and once you will start eating, you cannot resist the temptation and extravagant taste. Get in love with the creamy - cheesy aromatized air magnetizing you with the healthy Macaroni and Cheese Dinner in SpongeBob shape. Serving size 2.5 oz (70g / about 1/2 Box) (Makes about 1 cup).